The 20 Rider Kicks banner is been Bandai’s way of celebrating all things Kamen Rider, and where would a Kamen Rider be without a trusty transformation belt? 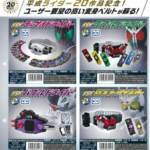 Revealed in toy catalog scans via J-Hero.com are the 20 Rider Kicks DX Kamen Rider Belt reissues each one slated for release in October. In the first batch of these reissues we have the DX Deca Driver, and W Driver, both appear to be rebrands of the Super Best versions. In addition to the Lost Driver which will include non-T2 versions of the Skull and Eternal Gaia Memories along with Kamen Rider Gemm’s Buggle Driver and Dangerous Zombie Gashat. The W and Deca Drivers will both retail for 7500 yen while the Buggle and Lost Drivers will cost 6500 yen a piece, an excellent alternative to those that may have missed out on these Belts the first time around or for new Kamen Rider fans looking to get their first one! The dead man who walks finally gets the renewal treatment he deserves after languishing for nearly 8 years with the inferior original figure. Katsumi Daido, the Kamen Rider who would’ve taken the city of Fuuto with his absolute strength, faced off against Kamen Rider W in the A To Z: Gaia Memories of Fate feature film. Now he can finally face off against his rival in premium figure form with the recently released S.H. 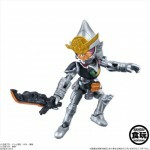 Figuarts Shinkocchou Seihou Kamen Rider Eternal! Seihou Eternal is a lavish love letter to this one-off villain. Made from the same exquisite Seihou W mold, Eternal is a dream for posing. But more than that, this figure is spared no expense for his accessories. Decked out with the “Strengthening Armament” parts of 26 full Gaia Memory Slots, alternate empty slots are also included. We even get a whopping 6 sets of hands, 3 Gaia Memories, the Eternal Edge dagger, and the fantastic Eternal Robe! This cape accessory is by far the greatest achievement of this figure. Fully poseable, thanks to metal wires, this cape can assume a variety of natural and dynamic poses that make this figure feel like it walked right off the screen. We’ve attached the full 100+ image gallery to this post, but you can also check out our lengthy review of this figure in the full gallery thread. Just click “Discuss on the TokuNation Forums” at the bottom of this. We’ll be back soon to cancel the apocalypse with a round of galleries from Pacific Rim Uprising! The Tamashii Webshop has just updated us with the latest premium release from their Shinkocchou Seihou line. Following up on the hugely successful releases of Kamen Rider’s W & Accel, it’s time for their movie nemesis to make his debut, S.H. 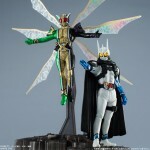 Figuarts Shinkocchou Seihou Kamen Rider Eternal! Eternal looks to possibly be one of the most stunning releases in this line yet. Using the excellent W body mold, Eternal also features the very first poseable cloth cape on a Kamen Rider figuart ever! 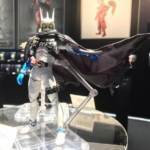 We’ve seen it on other recent figures like the Dark Knight Trilogy Batman, but this is the first Kamen Rider figure to feature such a cape. Eternal also includes numerous extra hands, Gaia Memory holsters, and his iconic Eternal Edge. This release looks to be the all in one package for W collectors. Shinkocchou Seihou Kamen Rider Eternal is set for release in January 2018 as a Tamashii Web Exclusive for 7884 yen. Get with your preferred web exclusive service or middleman in the near future to secure your order. A fresh batch of Images for the third case assortment of the fantastic 66action series have appeared online! The fourth mystery figure has also been revealed, and it should come to no surprise that it’s Kiwami Arms wielding the DJ Gun as his included side arm. Other figures in the case assortment include Shin Zangetsu, Fourze Base States, and Eternal sans his cloak. The case assortment is due out this August. The 66action Kamen Rider candy toy line is coming back for a third case assortment! 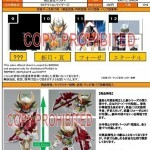 This case contains Kamen Rider Shin Zangetsu, Fourze Base States, Eternal, and one more yet to be announced figure. Due out in August, each figure will run you a wallet friendly price of 380 yen each for singles. 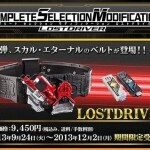 The Lost Driver as worn most notably by Kamen Rider Skull and Eternal will be getting the Complete Selection treatment. Pre orders for the Complete Selection Lost Driver will be opening September 24th Japan standard time and it’s currently slated to be shipped out in December. Retailing for 9,480 yen this piece will include the Eternal and Skull Gaia memories. Bandai’s latest HDM set features the fan favrioute Kamen Rider W in his Cyclone Joker Gold Extreme form facing off against Kamen Rider Eternal. The set recreates the final battle in Kamen Rider W Forever A To Z: The Gaia Memories of Fate and each figure will be connected to his own personal display stand. Gold Extreme’s stand has been modeled after the Extreme Memory and Eternal’s stand represents the Lost Driver. Gold Extreme’s stand will feature LEDs and in addition you can connect it to Eternal’s stand. Pre orders have already begun for this set it will retail for 3360 yen. The set will be shipping out in March 2014. Super Climax Heroes New PV Trailer and Characters! 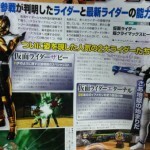 A magazine scan shows two new Riders have been added to the Super Climax Heroes roster. Joining the fight is The Bee from Kamen Rider Kabuto, and Eternal from the Kamen Rider W A to Z movie! SIC Kamen Rider Eternal and Accel? 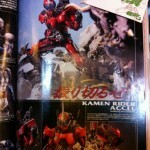 Recently two images taken from a magazine show off what seem to be SIC versions of Kamen Rider Accel and Eternal from the show Kamen Rider W. Not much else is know so far, but stay tuned for more information as to if they will even get released. › Companies: Tamashii Nations, Bandai of Japan › Characters: Kamen Rider Accel, Kamen Rider Eternal › Toyline: S.I.C.